I have always been emotionally attached to nostalgic things. Items I would never choose in a store find places in my home because of their sentimental value. Floral serveware from a grandmother’s table, a manual ice chipper from a great uncle’s kitchen, a set of lead soldiers from a father’s playroom. These pieces take some work to incorporate into the simple, cohesive style I strive for in my decorating, so I use them sparingly and rearrange them often. All that changes when December arrives. Never are these two aesthetic endeavors—simplicity and sentiment—more at odds than during the holiday season. I want my house to look like the Pottery Barn Christmas catalog, clean and coordinated and cozy. But I can’t bring myself to part with the misfit ornaments: the one-armed angels, the glue-and-glitter masterpieces, the clothespin reindeer. Herein lies December’s decorating conundrum. 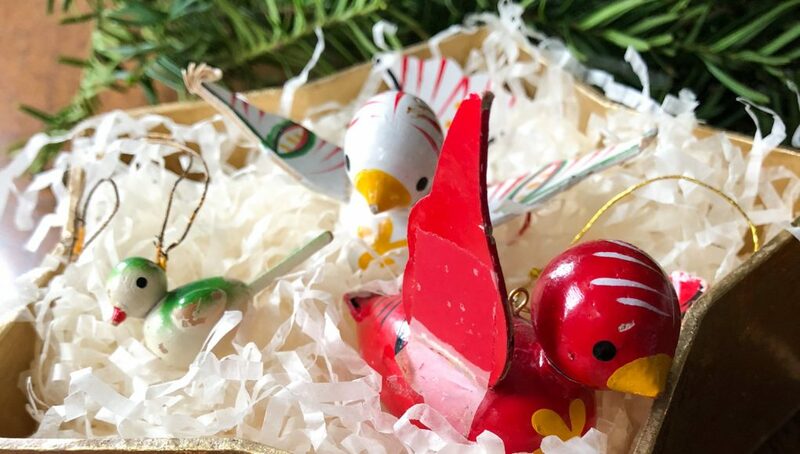 How do we incorporate nostalgic objects—in all their imperfect, off-trend glory—into modern holiday decorating? The key is to be intentional about it. 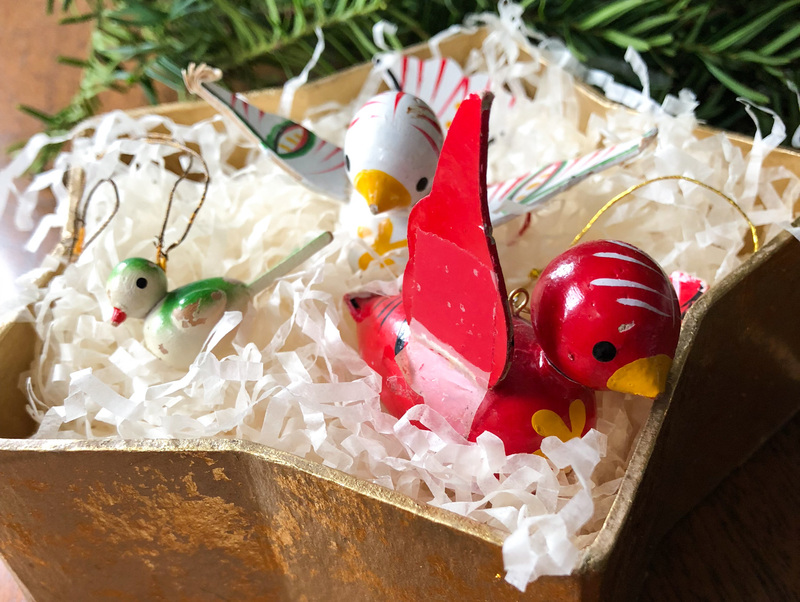 A few years ago I inherited several boxes of vintage ornaments from my great uncle. While the thought of having a tree covered in these shiny orbs is appealing, it’s not in the cards… because where would I display all the other ornaments? I have three large vases (from Pottery Barn, incidentally) in my living room year-round, usually filled with beach rocks, driftwood and seasonal greenery. In December the rocks and sticks go into storage and the vases hold the vintage bulbs. Sometimes I mix all the colors together, other times I sort them into palettes. Either way, they add festivity to any room and shine beautifully at night when the window candles are glowing. With many of my sentimental pieces, color is the biggest challenge. Traditional holiday colors—bright reds, greens, and blues—aren’t in my home and can feel garish when overdone in otherwise neutral spaces. Using these classic seasonal hues as intentional pops of color works well against the muted backdrop. I have a figure from the 1950s, a Santa with a blazing red suit and intensely blue eyes. 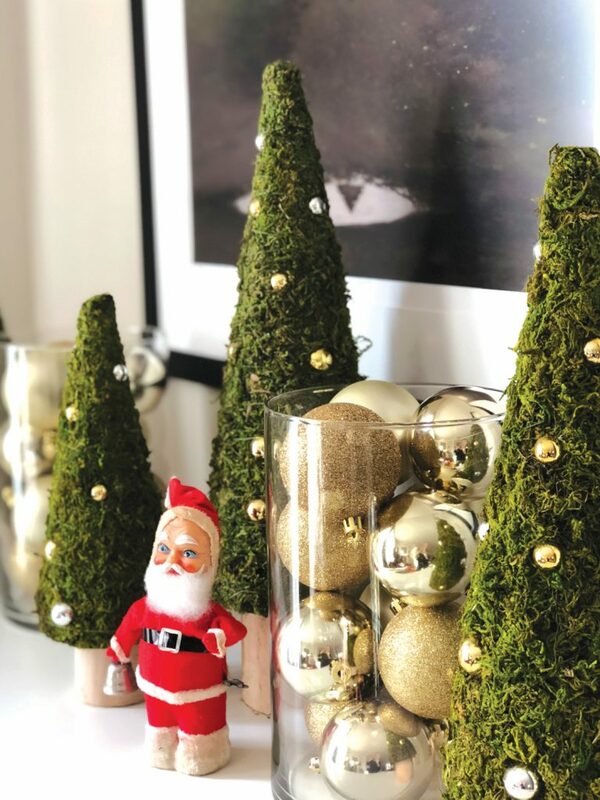 Paired with simple green trees and a vase of modern gold bulbs, he becomes a statement piece and a conversation starter without detracting from the rest of the room. A point of holiday contention in my home is ornament display. Again, I find myself Pottery-Barn-dreaming of a duotone scheme, all red and silver decorations and twinkly white lights. Alas, no. We put every ornament we own on the tree so we don’t hurt any of their feelings. Every. Single. One. And while it is fun to pull them all out and remember where they came from, after decades of wear and tear some aren’t exactly looking their best (and you can only fit so many on the back of the tree). A few of my personal favorites are the worst off: three birds with chipped paint, broken tail feathers and taped wings. 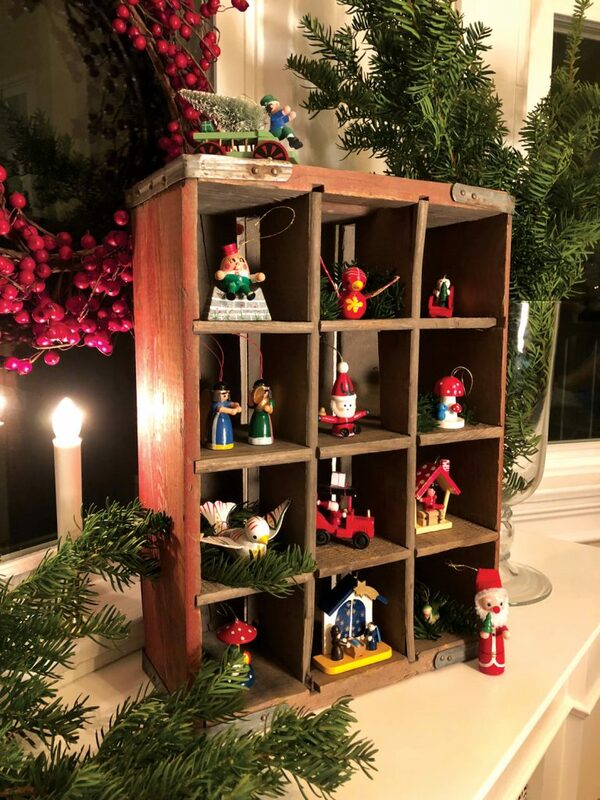 Displaying them in an old Coke bottle crate with other painted wooden decorations is a nice way spread ornaments into another room without having another tree. And for those folks who do prefer a mono-or-duotone color scheme in their main living space, this allows the misfit trimmings to have their moment. 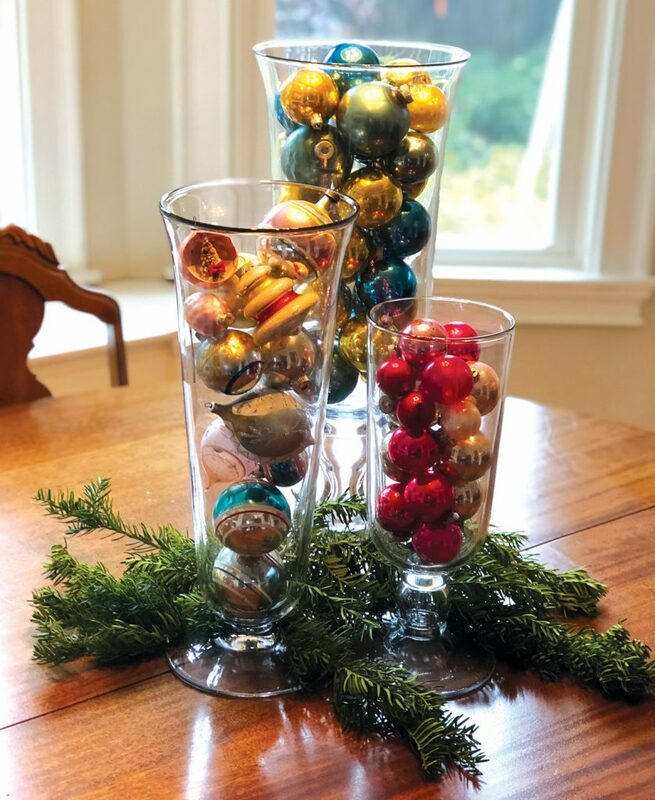 Giving each nostalgic item or collection space to shine makes it possible to incorporate sentimental pieces into modern holiday decorating and still achieve a balanced overall effect. My house is never going to look like the Pottery Barn catalog. And at the end of the day I’m OK with that, because if all my decorations were shiny and new, there would be no stories to tell and no nostalgia to pass down.